Revenue generated through the recycling project is an important source of funding for ZVT and is used to fund the gardener the Trust employs to maintain what is known as the Westlake Wetlands Garden. 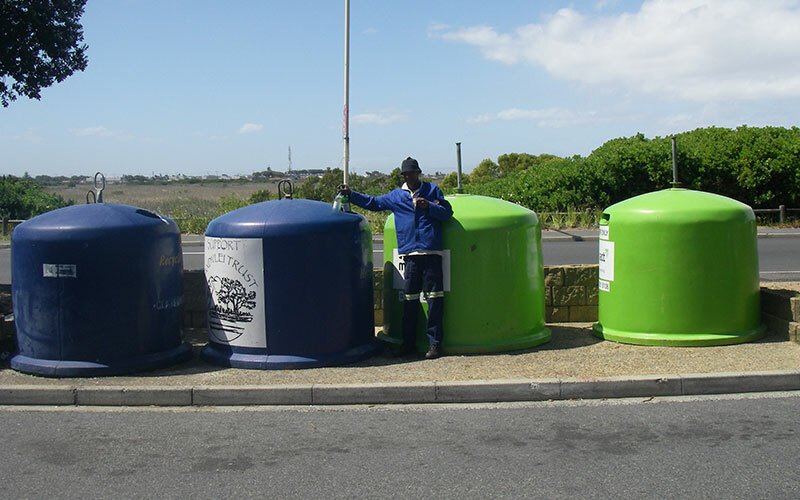 The City of Cape Town has three operational landfills for the disposal of waste. One of these, the Coastal Park Landfill is situated off Baden Powell Drive within a few kilometres of the Zandvlei Estuary. The Coastal Park Landfill site is 75 hectares and will eventually be about 45 meters above the ground when it is completed. This site was established in the early 1980’s and will be operational until 2025. This landfill has about 60,000 tons of waste, rubble and sand delivered to it each month. The City’s 2018/19 budget has provided for a fully functional recycling facility at this site. At present recycling is done on a limited scale. Methane and other gases are being generated at the facility will eventually be used to generate electricity for the Capricorn area. In 2001 the Zandvlei Trust installed two glass-recycling igloos at a site adjacent to a shopping centre in the suburb of Lakeside. At this site the Trust also services two paper bins. There is another paper bin at the Eastlake Shopping Centre in Marina da Gama. The glass bins yield in excess of 1,5 tons each week and the paper bins yield about 4 tons each month.